When chemicals are dissolved in water, the mixture can become either acidic or basic (alkaline).Vinegar and lemon juice are acidic substances, while laundry detergent and ammonia are basic.With a pH of 7.0, pure water is neutral. Acid and basic are two extremes that describe the property of a chemical, such as how hot and cold are used to describe the two extremes of temperature. pH (potential of hydrogen) is the measurement of acidity or alkalinity of a substance when dissolved in water. 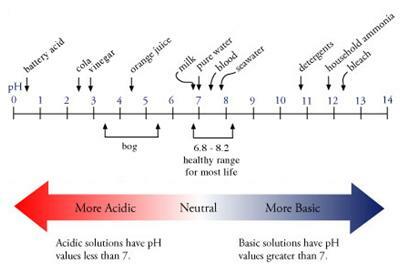 Just as degree is used to measure precise temperature, pH gives us the precise measurement of acidity or alkalinity. Extremely acidic or basic materials are called “reactive”, and can cause severe burns. They are very aggressive and corrosive. Examples include automobile battery acid which is very acidic, and drain cleaner, which is very alkaline. pH can be very good at cleaning certain types of soils but that same chemical can damage other materials. The following is a table showing what types of soil that can be cleaned at a certain pH as well as the damage it can do to certain materials. An acid solution for example is needed to remove metal oxide, such as rust, and an alkaline solution may be needed to clean a heavily soiled, solution-dyed olefin carpet in a rental unit. A close to neutral pH is needed to clean wool, silk or stain resistant fibers. The pH scale is very helpful in removing stains. Using a cleaner with an opposite pH (relative to the stain) can be used to neutralize and remove the stain. A certain number of set stains cannot be completely removed with a universal spotter. The use of specialized spotters is dependent entirely on the composition of the soil. In other words, we need to know what the spot is before we can effectively remove it with a specialized spotter. 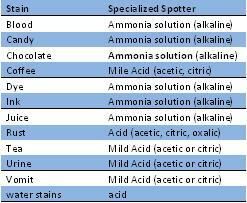 The following table shows a few examples of stains that can be neutralized with a specialized spotter. In general Acids can be used to clean mineral deposits, such as: iron stains, lime build-up, uric acid stains, rust, scale, water spots, and soap deposits. Alkalies can be use for most common forms of soil: including food stains, oils, and baked-on grease. Here at PROimage Facility Services, Inc. we would like for everyone to be familiar with the standard chemicals and ph scales. In our facilities we use all of these steps and procedures to guarantee a detailed as well as clean environment.